CHICKEN MARBELLA: WELCOME TO THE CLUB | Jane Lear. Writing on Food and Travel. In 1978, the year I moved to New York, the Upper West Side was still gritty and rough around the edges. Except, that is, for The Silver Palate, a valiant little shop that had opened the previous year on Columbus Avenue, at 73rd Street. Its concept—elegant yet accessible take-home food for dinner parties, picnics for concerts in Central Park, and every occasion in between—was as bright and shiny as its inviting storefront. It was the genius child of Julee Rosso, an advertising executive who loved good food, and Sheila Lukins, a Cordon Bleu cook who ran a catering operation out of her apartment at the Dakota. Called The Other Woman Catering Company (“So discreet, so delicious, and I deliver”), it aimed to snaffle proto-Yuppy bachelors, who were expected to entertain graciously at home without the benefit of a wife in the kitchen. The Silver Palate was a terrific source for basics, such as baked ham and potato salad, and gift-worthy preserves and pickles, but it was also where I first tasted a triple-crème cheese and chicken liver pâté with green peppercorns. It was where I was first exposed to a different style of entertaining, one that skipped over formal “company” dishes in favor of things that were altogether more intriguing: Greek mezes, Spanish gazpacho, Moroccan chicken pies wrapped in a paper-thin, fabulously flaky pastry crust, and, most famously, Chicken Marbella, with its heady mix of prunes, olives, capers, and garlic. I can’t imagine what Lukins went through to source her ingredients; the New York City Greenmarket was a fledgling operation back then, and simply getting a steady supply of good-quality olive oil or red-wine vinegar must have taken dogged work. Fast forward to 2014, and the abundance of riches available at Eataly, say, or Gotham West Market—let alone the Greenmarket, which has expanded into a large, flourishing network and operates year-round—really puts things into perspective. 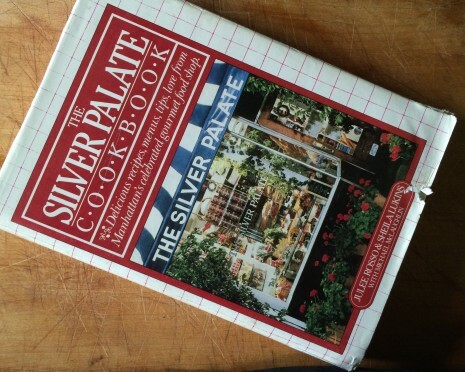 The Silver Palate went national in 1982, with the publication of The Silver Palate Cookbook. It made publishing history, with something like 870,000 copies in print after three years, and it made culinary history, too, changing the way many Americans cooked, ate, and thought about food. I think an entire generation of young women must have given or received it at a bridal shower. And chicken Marbella (pronounced “mar-BAY-ya,” after the Andalusian resort town frequented by European aristocrats and deeply tanned film stars) became the default dinner-party dish of the 1980s. In large part, I think this was because it was just so damn liberating. Because the chicken had to marinate for a day—and was also very good if made ahead and reheated—it bent to your schedule, not the other way around. What this meant, practically speaking, in New York in the ’80s, was that you could throw the thing together on a Friday morning, before climbing into uniform (pantyhose, floppy foulard silk tie, and “women’s suit,” which involved a skirt, not pants, from Brooks or Gorsart), and go gallivanting off to work and then, possibly, the Odeon. Even if you stayed out far too late, you could still pull it together for a dinner party Saturday evening and make it look easy. That’s my theory, at any rate. Chicken Marbella eventually ran its course, of course, and became a period piece, mentioned among well-versed home cooks of a certain age with a snicker that wasn’t at all unkind, but knowing. It was as good as a secret handshake. And it still is. A few weeks ago, I found myself in a cookbooks-we’ve-known-and-loved conversation with the wise and wonderful Janet McCracken, the former deputy food editor at Bon Appetit and now the test kitchen director at EveryDay With Rachel Ray magazine. “Remember Silver Palate?” she asked, leaning back in her chair. Our eyes met. “Chicken Marbella!” we exclaimed in unison. “For some reason, I’ve been craving it,” I admitted. “Well, it’s the perfect fall dish,” Janet said, and she wasn’t just humoring me, she was right. “They really knew how to use vinegar,” she added. “It’s a more complex acid than citrus. And there’s something about the vinegar and brown sugar together ….” Yes. And plain-old supermarket capers, packed in a vinegar brine, or what Lukins and Rosso call “juice,” work to great advantage here, as well. 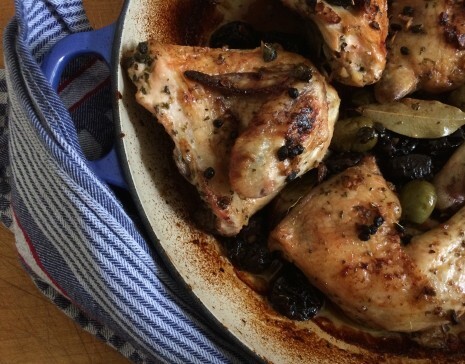 The combination of prunes, olives, capers, and garlic isn’t novel any more, but Chicken Marbella is still delicious and accommodating to a hectic schedule. It also handles improvisations—a little preserved lemon, for instance, or dried apricots instead of prunes—with aplomb. It’s good hot, with rice pilaf, couscous, or barley, or at room temperature, sliced and put over arugula or other salad greens. Be sure to whisk some of the pan juices into the vinaigrette. 1. In a large bowl, combine the olive oil, vinegar, prunes, olives, capers and juice, bay leaves, garlic, and oregano. Add the chicken, generously season with salt and pepper, and turn the chicken to coat. Cover and let marinate, refrigerated, overnight. 2. Preheat oven to 350ºF. Arrange the chicken in a single layer in 1 or 2 shallow roasting pans, and spoon the marinade, prunes, olives, capers, and bay leaves over it evenly. Sprinkle the chicken with brown sugar and pour the wine around (not over, thus washing off the sugar) it. 3. Bake the chicken 50 to 60 minutes, basting a few times with the pan juices (again, try to avoid washing off the sugar) once it begins to brown. The chicken is done when the thigh pieces, pricked with a fork at their thickest, yield clear yellow (rather than pink) juices. 4. Transfer the chicken, prunes, olives, and capers to a serving platter; discard the bay leaves. You can either moisten the chicken with a few spoonfuls of the pan juices, or, for a little more finesse, put the roasting pan on the stove top and bring the pan juices to a boil; reduce slightly and strain through a fine sieve into a bowl. Pour over the chicken and sprinkle with parsley. Jane, I was JUST contemplating featuring Chicken Marbella on my blog… it has been my go-to entertaining dish for years – seemed I should share it. Perhaps I’ll tinker with some updates, but the original has served me so well. Thanks so much for this wonderful piece. what a wonderful article any foodie’ would appreciate….never knew the recipe or about ‘the Silver Palette, New York and the 2 authors…definitely will do the recipe….New York has such rich culinary past and this was a gem’…thank you for writing the article…KLS…. Jane! Stumbled upon your lovely blog on Alimentum. I’ve been a Chicken Marbella gal for years–it never ceases to be a showstopper. Plus, who can beat the ease of do-it-before cooking. Thanks for the history behind it. Happy 2015! I love Alimentum! And thank you for the kind words….Happy 2015 to you as well! I’m late to the party here…have been making Chicken Marbella for years – but with a dry red wine instead of white (it started as an accident). And, I add the wine and brown sugar at the same time as everything else (another ‘accident’) It is wonderful! !